This winter (2015) we (Urban Restart in collaboration with architecture student Kurt Cleary) participated in the competition ” Shabby Shabby Apartments” organised by joint initiative of Theatre Münchner Kammerspiele and architecture collective Raumlaborberlin. 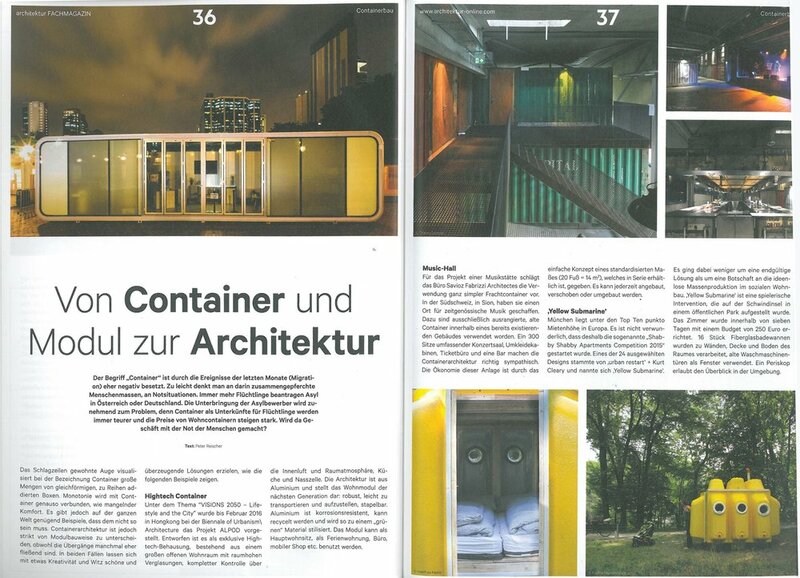 Among more than 250 entries we, together with other 23 collectives, have been selected by international jury to come and build our apartment in Munich in September. 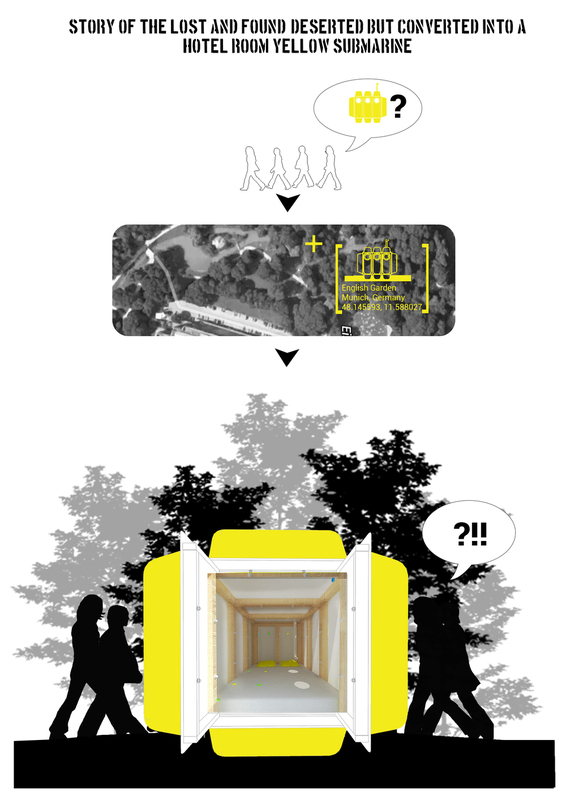 The competition invited collectives to invent apartments that everyone can afford (The budget was 250 euros). As living in a city centre of Munich is becoming increasingly expensive, competition challenges to reinvent idea of housing ground and soil and build without using up the world’s resources. A low cost design, use-what-you-find and infrastructure built from as little resources as possible were key aspects to focus on. 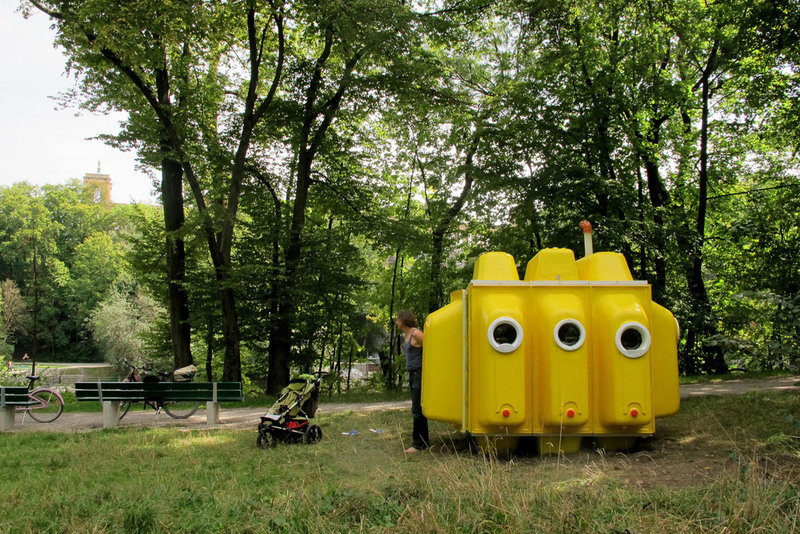 Our team came up with a lost “Yellow Submarine” idea placed on the edge of English Gardens in Munich. 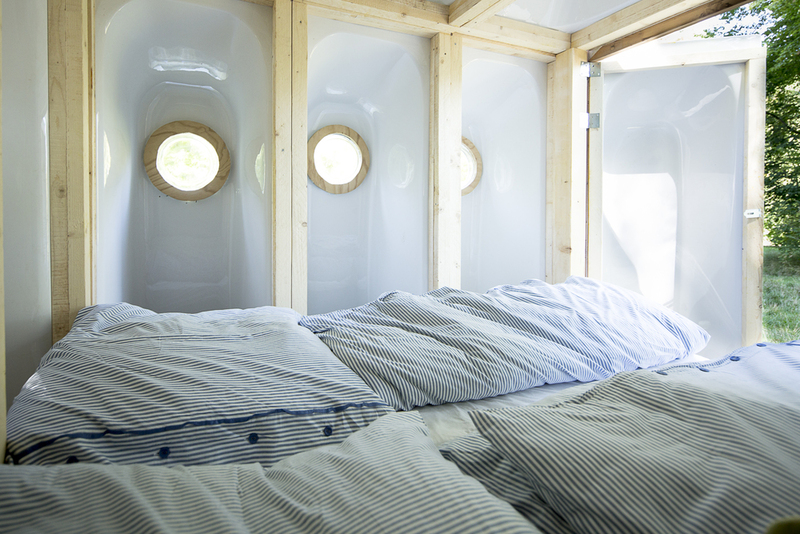 Our proposal offered a modular design which re-purposes bathtubs into the Hotel room as well as using old washing machine doors for windows and pvc pipe for periscope which allowed to observe the nature from your bed. As a winning project, we traveled to Munich on the 3rd of September where Shabby Shabby camp built out of scaffolding and giant paper blocks welcomed us. We have been living, sleeping, working, eating, bathing and partying with other 120 people there. 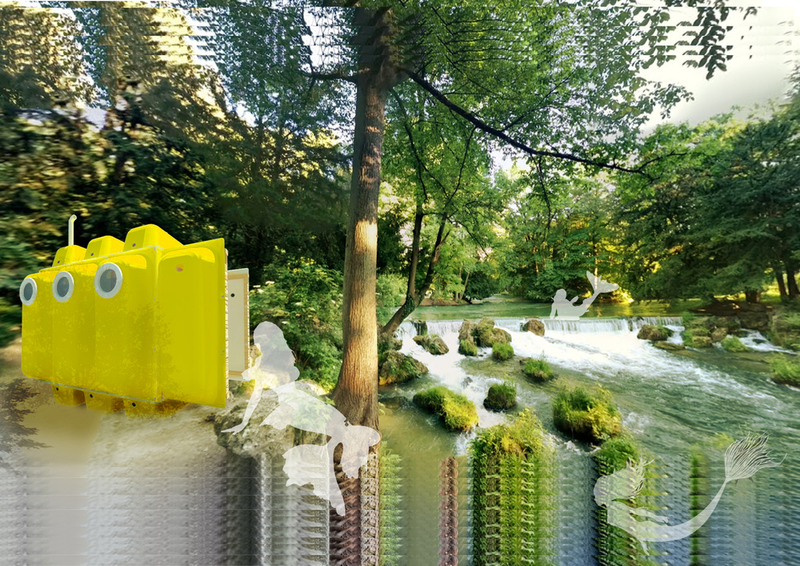 Besides that, the camp, designed and built by Raumlaborberlin and Tu Munich students, offered to dive in a „Wild Water Wonderland“ which included DIY sauna, pool, fountains, fog room and jacuzzi! There were lots of fun distractions… but apartments were eventually completed and fitted on site in 9 days. Our team had an opportunity to be the first to test our apartment and have a supper and breakfast by the river Isar. However, sad and devastating news reached us after 4 days , when on the 15th of September the apartment was burned down. Fortunately, no one was hurt. The police is investigating the arson, therefore our apartment is not available to rent anymore. However, the smoke detectors and fire extinguishers are fitted in all apartments to keep them safe as possible. Shabby Shabby Apartments is a real social experiment which allows to see a different view of the city with one of the top-ten-rents in Europe. 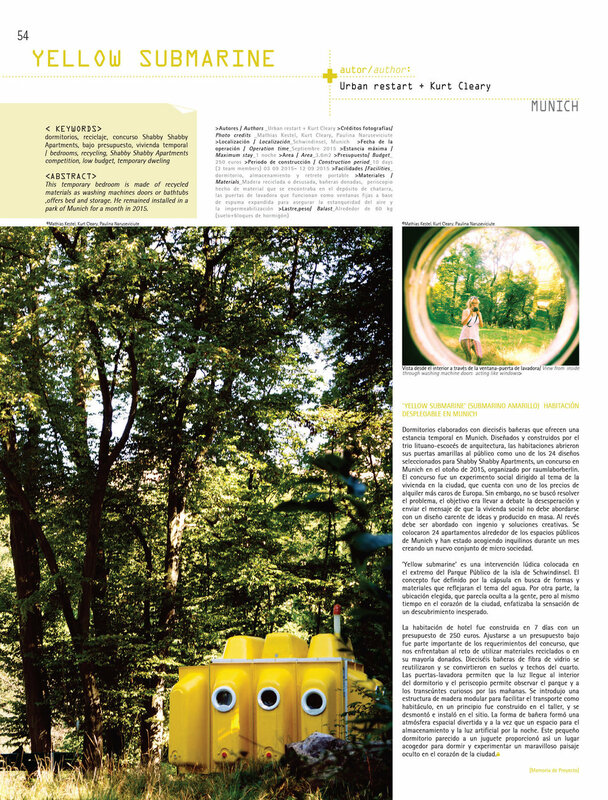 The competition does not offer an answer to the problem in Munich of shortage of social housing , it rather seeks to despair debate to the housing situation and sends the message that social housing should not be addressed with idea-less mass-produced design but with ingenuity and inventive solutions.